Free Enzyme CD: Yes. Please send a free Systemic Enzyme CD. No thanks. I don't need the CD. "Revolutionary. 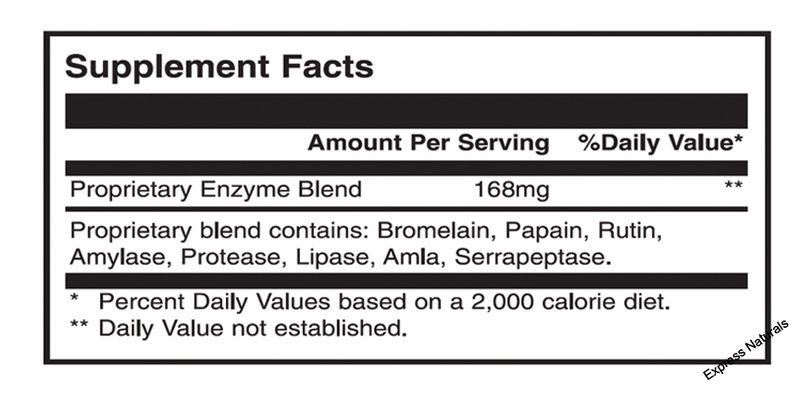 The same powerful ingredients as the original Vitalzym, but in a gel cap form. 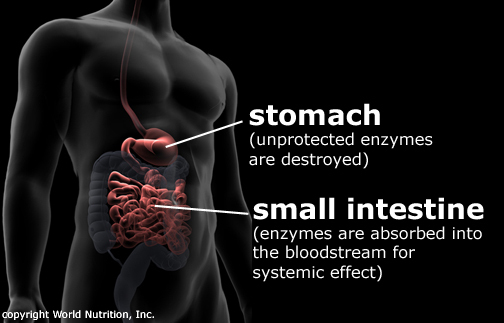 We don’t know of any other vegetarian systemic enzyme that completely bypasses the stomach acids. This one can even be taken close to meals. Try them about 20 minutes before a meal for best enzyme absorption. These new capsules were launched last year and feedback has been tremendous." 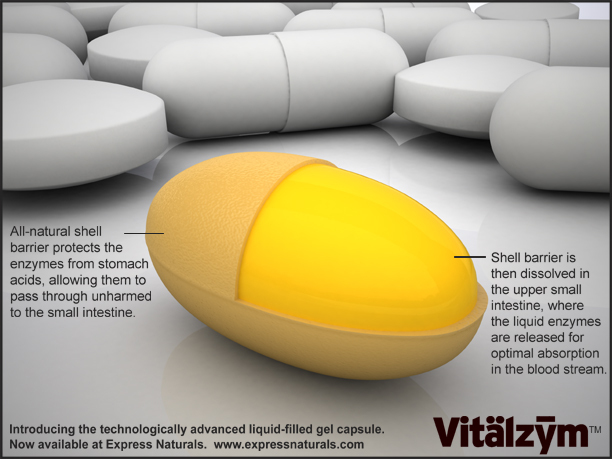 Vitalzym Liquid-Filled Gel Capsules are protected by a technologically advanced enteric coated capsule that is used by today's most advanced pharmaceuticals. The all natural, non-toxic coating allows the enzymes to bypass the stomach acids so that they are 100% available in the small intestine. This delivery system is revolutionary to systemic enzyme blends, in that there is no loss of enzyme due to digestion or stomach acidity. Most users will experience at least double the enzyme potency of the original Vitalzym, whereas some users may experience an exponentially greater effect. The difference is dependent upon each user's pH levels and dosaging habits. If you are currently taking the original Vitalzym, World Nutrition recommends first trying to reduce your dosage by 50%. Bromelain - An enzyme found in pineapples that breaks down other proteins, such as collagen and has anti-inflammatory properties. juice and parts of plants, Amylase digests carbohydrates and helps convert starch to sugar. Rutin - One of the many existing flavonoids. Flavonoids support health by strengthening capillaries and other connective tissue, and some function as anti-inflammatory, anti-histaminic, and antiviral agents. Vitalzym is regulated by the Pharmaceutical and Food Safety Bureau under the Ministry of Health, Labor, and Welfare in Japan. This agency is the Japanese equivalent of the FDA of the United States Department of Health and Human Services. Since Vitalzym is regulated in Japan, it must adhere to manufacturing requirements that are far more stringent than dietary supplements manufactured in the United States. Supplements manufactured in the United States are considered food grade, and thus, are not regulated as stringently as in Japan. Quality control requirements of a licensed manufacturing facility in Japan are considered the most hygienic of any industry. Extreme measures are taken to avoid any possibility of contamination. Precautions include clean rooms, dust particle control, and sophisticated air filtration systems. During frequent site facility inspections, the government inspects all laboratory equipment and safety measures. Each inspection must be passed in order to retain the export licensure. World Nutrition is also required to notify the Japanese Pharmaceutical and Food Safety Bureau of any variance to the registered ingredient blend. Any blend change would require a new registration for export. Every batch of product must be inspected before and after mixing to test adherence to the registered blend. In addition, every lot of raw materials received by our manufacturing facility must be tested independently of the supplier for safety, impurities, potency, and accuracy. These records must be disclosed upon facility inspections. This dosage recommendation is for most users. The dosage recommended by your healthcare professional may differ. As a dietary supplement, take 3 capsules daily with water. Your healthcare professional may also recommend a higher activation dosage. Warning: If you are currently taking prescription drugs, consult your healthcare professional prior to use. For all conditions or illnesses, see a healthcare professional for a full evaluation, diagnosis, or treatment plan.